I've been sitting in this café for hours and have no progress in my workload to show for it. Ugh, it's the worst! Maybe my early afternoon bike ride to Germany for the exciting celebration of karneval ruined my focus from the start? Hm, not so sure, but that certainly deserves a quality blog post. Until I have the time do you think you can wait patiently with the less thrilling parts of my weekend? Last night at the peak of my loneliness (dramatic much? 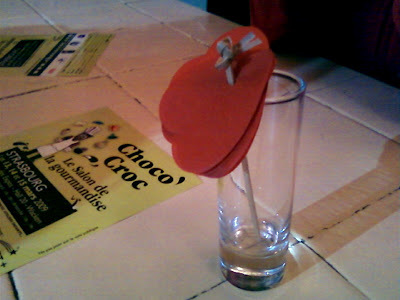 ), my friends called me to go out to for a romantic dinner. How could I refuse?! The three of us headed over to a small hole-in-the-wall place, Café Expat. One of us was single, while the other one and I were simply far from our boys, so a bottle of wine was a must. 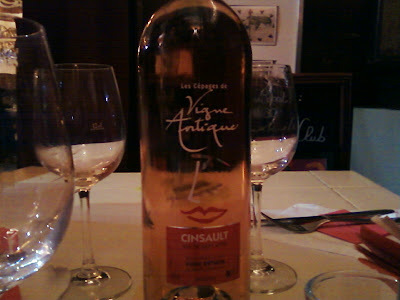 We ordered a bottle of the rosé... and a second one a bit later... Happy Valentines Day ;). 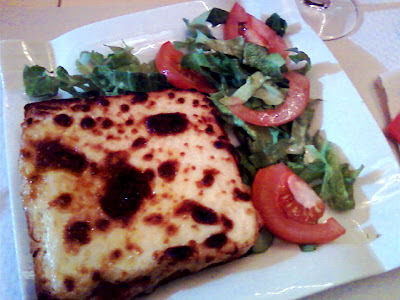 I had a Croque Monsieur, a hot ham and cheese sandwich, with a side salad. I'm so not a ham person, especially after having been vegetarian for so long, but last night nothing else sounded quite as good. 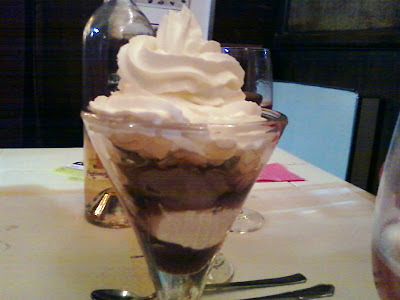 le Mousse au Chocolat. What a delectable "feel good" meal! Girlfriends are the perfect antidote when you're missing a very special boyfriend. As for Friday night, I spent the evening with my host mom at a work-related event. She works with Special Education programs at a few schools in the area. Blending her artistic passions with her current occupation, she decided to contribute to the showcase. Her and I both wore the neck-braces and got quite the positive response for them. So much so that I tooke some photographic evidence during a trip to le toilette :). The exhibit was beautiful with all different things created from medical materials or medical equipments. 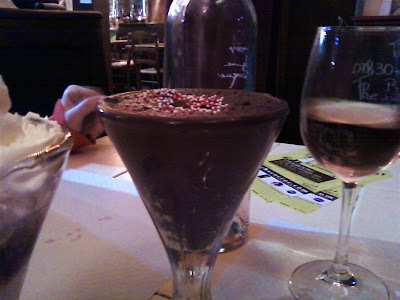 Then of course, the event had the usual fare: water, wine, and dessert :). Nevertheless dinner was kind of forgotten and both myself and my host mom had pieces of the Kugelhopf. One of the most famous Alsacian desserts, this part bread and part cake treat is very much like a brioche without being too rich or too plain. Delicious. Now I've really got to start being productive! Hope you had a great weekend... Á demain!